Wintry Sunday afternoons are made for roasted chickens or braised beef roasts so that their aromas may be savored. It’s also fun to feel like a pioneer, pulling homegrown root vegetables out of our “cold room” and snipping fresh herbs from kitchen pots as the snows fly and the winds howl. 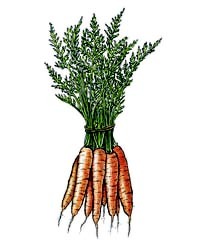 Cut Fennel bulb, Carrots, Rutabagas, Parsnips and Potatoes into 1 1/2" slices. Preheat oven to 325°F. Heat olive oil in heavy skillet over medium heat. Add chopped Onions and minced Garlic. Sauté for 10 minutes until golden, stirring often. Add red wine, beef broth, Tomato paste, 1 tablespoon Paprika, ginger, allspice, bay leaves, Thyme and Sage chiffonade (thinly cut ribbons). Bring to boil, simmer for 10 minutes. Pour broth into large Dutch oven. Rub paprika on all sides of beef brisket. Put brisket fat side up in the broth bath. Cover, bake for 1 hour. Arrange root vegetable slices around the brisket. Cover. Bake for 2 1/2 hours more until brisket is tender. Remove from oven. Transfer brisket to cutting board to rest the meat for 15 minutes. In batches, pour cooking liquid into blender to pureé with some of the vegetables, reserving the majority of the vegetables aside in a large bowl. Pour pureéd sauce into heavy saucepan: boil for 10 minutes until reduced to 3 1/2 cups. Season with salt and pepper. Thinly slice brisket across grain and arrange on a platter surrounded by root vegetables and drizzled with sauce. Garnish with fresh Parsley and serve with extra sauce. Serves 8.